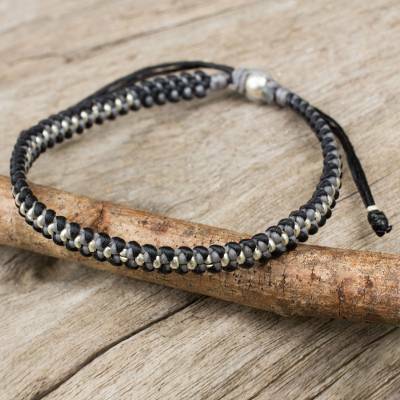 Hand Knotted Macrame Bracelet with Hill Tribe Silver Beads, "Grey Black Progression"
Knotted by hand, this wristband bracelet features silver beads by hill tribe artisans. Thailand's Napapat combines grey and black cords to braid this bracelet design. You can find silver accent braided bracelet 'Grey Black Progression' by Napapat in jewelry categories such as Hill Tribe Bracelets, No Stone Bracelets, Polyester Bracelets, Silver Bracelets, Fine Silver Bracelets, Braided Bracelets and Wristband Bracelets. Enjoy exploring these sections for other Novica treasures. "Their works were very creative and beautiful, but also distinctly Thai: their methods unchanged from mother to daughter." "When I was young, I was a very active and imaginative girl. Growing up in Chiang Rai in a family with low economic means, I always enjoyed crafting my own toys and accessories with natural things around the house such as flowers, leaves, vines and scrap from my mom's projects. My dad is a skilled carpenter who would volunteer his time to building temples and schools. My mom always supported him as a perfect housewife. I also have a younger brother. Now, through my own achievements, I’ve been able to support him through school, and now he is training to be a soldier. "During my first year in college, I had a chance to go on a field trip to Chiang Mai City, in the center of northern Thai, which is only a couple hours away from my town. We were able to see many interesting places, but one really inspired me. It was a small village called Yao, situated on top of a mountain. I saw some hill tribe women braiding threads to make accessories. Their technique and unique style has been passed down from one generation to another. Their works were very creative and beautiful, but also distinctly Thai: their methods unchanged from mother to daughter. "One of the hosts of our field trip was the leader of the women in the village, her name is Mohloh. I asked her to teach me how to braid in their style and she told me it's deceptively difficult to teach, especially when I was only going to be there for a short time. She also warned me that I would need lots of patience and imagination to produce the kind of art they were making. I was undeterred, and spent the rest of the afternoon with Mohloh and some of the other women learning their methods. "At one point, Mohloh mentioned that the type of threads they are using tended to fray after getting wet. I was really fond of making them and curious to find out if there was any better thread to avoid the problem. When I returned, I looked into some other supplies that weren’t available to the people of Yao. I tried many different kinds of threads, but some were too large and couldn’t be woven easily. Others looked gorgeous, but sometimes the colors would run if they were washed. I finally found waxed cords. "Waxed cords are relatively thick and the waxed coating prevents them from fraying. They are much stronger, water-resistant and in my experience, this fact makes them last longer than leather. Because the strands are waxed after their dyed, there’s no risk of the colors running. This success gave me confidence and I set out to creating accessories with waxed threads exclusively. "After I graduated University, I started to create various designs of jewelry with silver pieces for my family, relatives, and friends. The feedback from my family was immediate. They loved this kind of jewelry. It had the same ethnic flair that they loved, but it was much more durable and they had something nice to wear in the rainy season. I was able to work full time selling mostly bracelets and necklaces. Some of my friends suggested that I make something bigger, so I set about making different kinds of belts. "I decided to move to Chiang Mai because there are better opportunities there to sell my collections, as well as for finding raw material. However, my heart remains in Chiang Rai, my birthplace. It is a lovely and peaceful city, so I always try to go and visit family and friends. "I had the opportunity to meet Achara, a Novica featured artist, who is a great inspiration for designing and creating my own jewelry. I saw her cooperating with hill tribe people in promoting their works. Her style is quite different from mine just as the hill tribes are quite different from one another. "Achara and I are both members of the same family here at Novica, since our hearts and our inspiration both lie with the hill tribe people. We both want to help them produce their high quality, creative work, and have their products and their methods carry on. "Its wonderful that I get the opportunity to share my love of creating jewelry with you. I wish that every one who wears my works will love them as much as I do, since I always put my heart and my soul into my little creations. I hope to have you as a part of our family in your hearts and in your minds. A very special thank you to all who purchase Novica products, I cannot tell you how much satisfaction it brings us here to be able to do what we love as a career. It’s your purchases that not only keep us working, but keep us motivated. Knowing that people everywhere enjoy something that I’ve designed and made is the best kind of praise I could have ever asked for. Thank you." Ordered this creation for my teenage granddaughter's birthday. I love how the colored textile is mixed with sterling silver beads. I know my granddaughter will love it also. I bought one of Napapat's bracelets as a gift, and loved it so much that I almost kept it for myself! Napapat's design skills and craftsmanship are awe-inspiring. The recipient loved her beautiful bracelet; I highly recommend this talented artist! I bought this for my daughter (always risky!) and she loved the combination of materials.